Orange is the main partner of ESN Slovakia and all Slovak sections. Orange Slovensko, a.s. is a member of the global Orange Group, one of the biggest mobile network operators and broadband internet providers in Europe. As of 31 December 2016, the Orange Group had revenues of EUR 40.9 billion, with 263 million customers using its services in 29 countries of the world. Orange Slovakia has more offers for both international and home students. There are two possibilities, either pre-paid card or contract. If you are staying in Slovakia less than 6 months, then the pre-paid SIM card will be a better choice for you. You do not need to go anywhere. You can get Funfon pre-paid SIM card from us already filled with 7€ credit. How to get it? It is simple just visit our office or attend a welcome day at university and you will find it in your welcome package :) Read more about Funfon offer and prices here. If you are staying in Slovakia longer than 6 months or you are a home student then probably ISIC paušál - contract for students will be a better choice for you. What is included in this contract? You get all of this only for 9€. 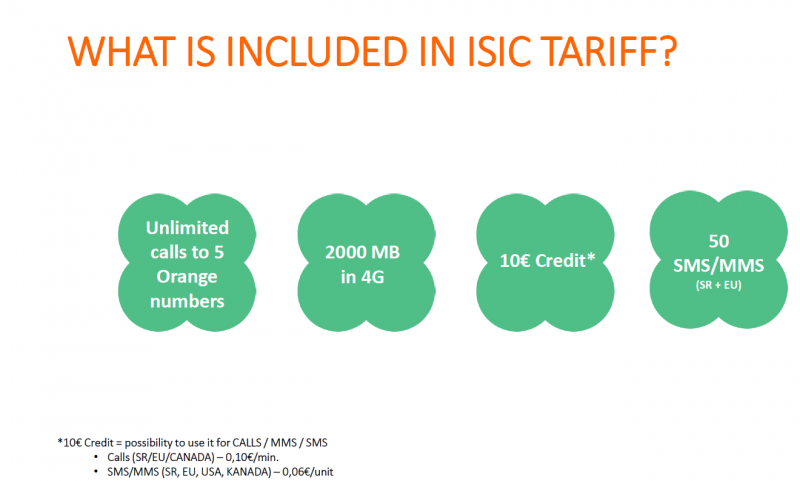 You can activate ISIC contract at every Orange store. You have to present only valid ISIC or EURO26 student card. More info here.